Glasgow 6th June between 6pm and 8pm. 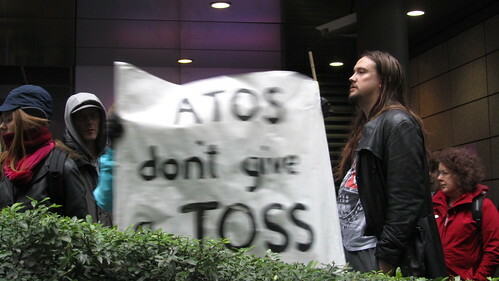 Disabled people, benefits claimants and supporters are to target recruitment events hosted by IT company Atos Origin. Pickets outside two events have been called so far where protesters have vowed to make sure potential Atos ‘Healthcare’ workers will know exactly how their future employers operate. All claimants on health related benefits are set to be retested by Atos, using a computerised system which has seen thousands wrongly stripped of benefits and been described as ‘unfit for purpose’. Atos rely on Doctors, nurses and midwives to carry out the tests – as one nurse, and former employee of Atos has said: “It’s against my principles to treat people with long term illnesses in such a disgusting way, so I had to give it up. “People go into those interviews and talk openly to you because you are a nurse and they trust you. Glasgow: The first protest will be held at the Atos Medical Assessment Centre, Corunna House, 29 Cadogon Street, Glasgow on Monday 6th June between 6pm and 8pm. Sadly many people cannot face the hassle of all this and give up and can be left destitute or worse. See Citizen’s Advice report ‘Not Working………’..March 2010 with evidence from before the new tougher test , it is even worse now. On 11th May Plymouth Claimants Union organised a picket at Argosy House as part of the national day of action against benefrit cuts and to expose Atos’ part in this. A dozen or so people with disabilities , carers , trade unionists and other anti-cuts activists let the Atos quacks know we are out to expose them for what they are …parasites on poverty. Keep the pressure on Atos – put people before profit. London Triton Sq: Benefit claimants, disabled people and supporters will be attending Atos Healthcare’s Recruitment Day on June 14th at 5pm and have called on people to join them. Bring bandages, fake blood, banners, placards, CVs, the noise. In the spirit of actively seeking work we will be demanding that if we are all ‘fit for work’ then Atos, notorious for a lack of disabled access in their premises, should consider us for employment directly. Poverty Pimps Atos Origin, the sharks responsible for the harrassment of sick and disabled claimants, are set to recruit hundreds of medical staff to carry out there notorious assessments on everyone receiving Incapacity Benefit. As part of this Atos will be having a stall at the annual BMJ Recruitment Fair in Islington Design Centre on 29th/30th September. A protest has been called outside on the 29th where we will be not just demonstrating but handing out information to potential recruits on the devastation these tests have caused to the health of already vulnerable people. “Please come and see us at stand 54 of the BMJ Careers Fair” say Atos on their website. Ok then we will. Atos will also be exhibiting at the RCN Bulletin Jobs Fair at the same venue on 13/14th September and the CSP Congress in Liverpool on October in Liverpool on 7/8th October. We might go and see them there too. No doubt a whole host of private companies itching to get their hands on the NHS will be recruiting there as well. We might have a chat with a few of them as well.